Harvard Book Store welcomes the creator of the popular webcomic Hark! 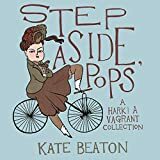 A Vagrant KATE BEATON and author of Outside the Box: Interviews with Contemporary Cartoonists HILLARY L. CHUTE for a presentation of Beaton's latest comics collection, Step Aside, Pops: A Hark! A Vagrant Collection. Hillary Chute is the author of, most recently, Why Comics? From Underground to Everywhere (HarperCollins, 2017). Her other books include Disaster Drawn: Visual Witness, Comics, and Documentary Form; Outside the Box: Interviews with Contemporary Cartoonists; and Graphic Women: Life Narrative and Contemporary Comics. A Professor of English and Art + Design at Northeastern University, she is also Associate Editor of Art Spiegelman’s MetaMaus and co-editor of Comics & Media: A Critical Inquiry Book. She is a columnist for the New York Times Book Review on comics and graphic novels. Kate Beaton is a Canadian cartoonist who appeared in the comics scene in 2007 with her online work Hark! A Vagrant! Since then, she has become a fan favourite and has garnered a significant following, with illustrations appearing in places like the New Yorker, Harper’s, and Marvel’s Strange Talesanthology. Her first book with D+Q, Hark! A Vagrant, spent five months on the New York Times bestseller list, and topped best of the year lists from Time, E!, Amazon, and Publishers Weekly. Beaton's cartoons often display a wonderfully light touch on historical and literary topics. The jokes are a knowing look at history through a very modern perspective, and a campaign against anyone with the idea that history is boring. Kate Beaton lives in Toronto, Canada.